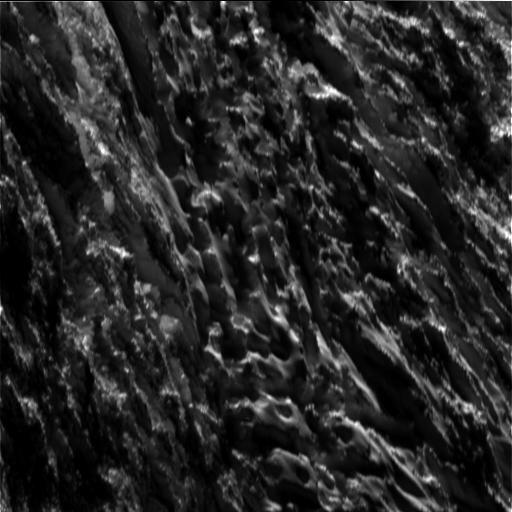 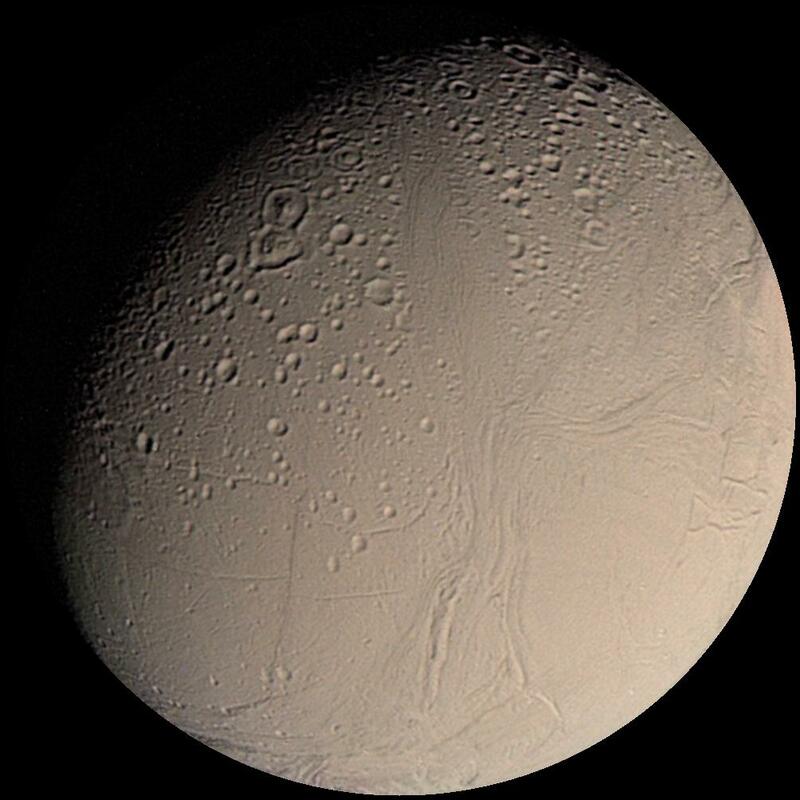 for me, this moon is more fascinating than Enceladus. 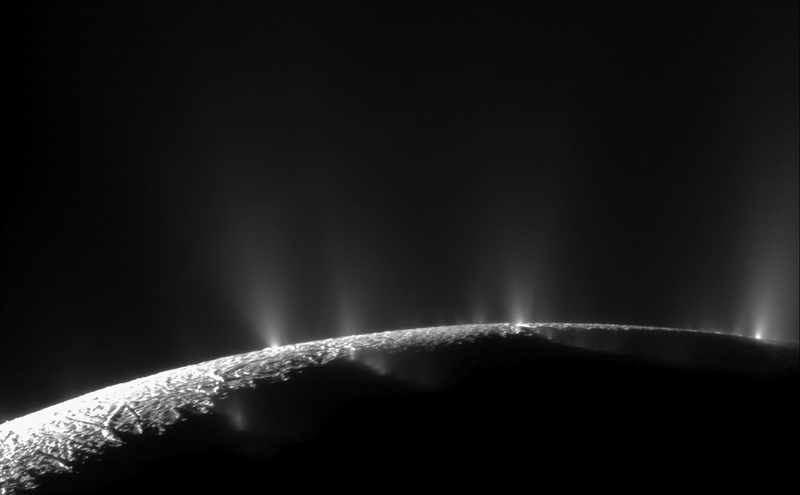 i understand processes that produce geysers. 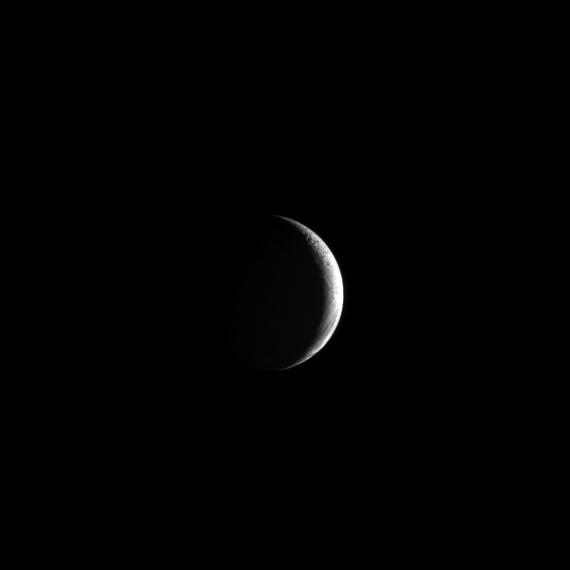 i can wrap my mind around the process that produces the color dichotomy. 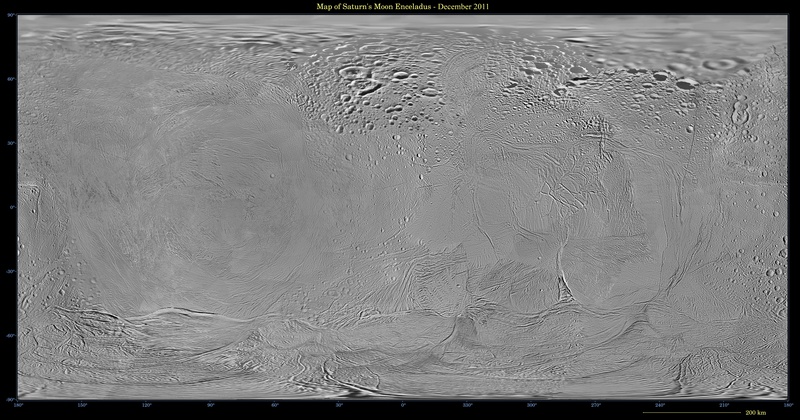 it's that equatorial mountain range that really gets me. 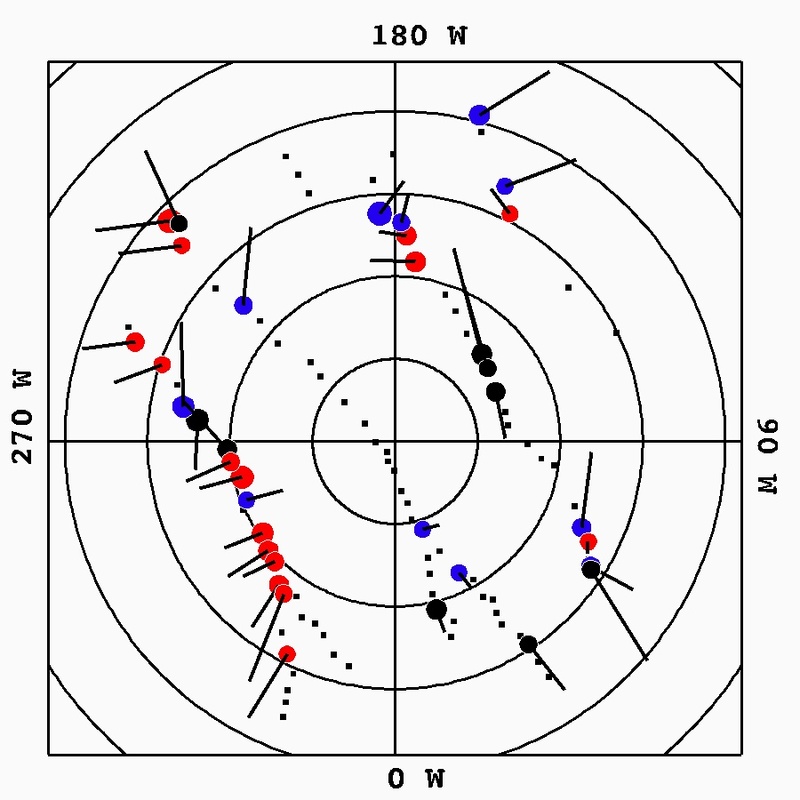 the leading hypothesis i've seen is sound, but i wonder if there is more to it. 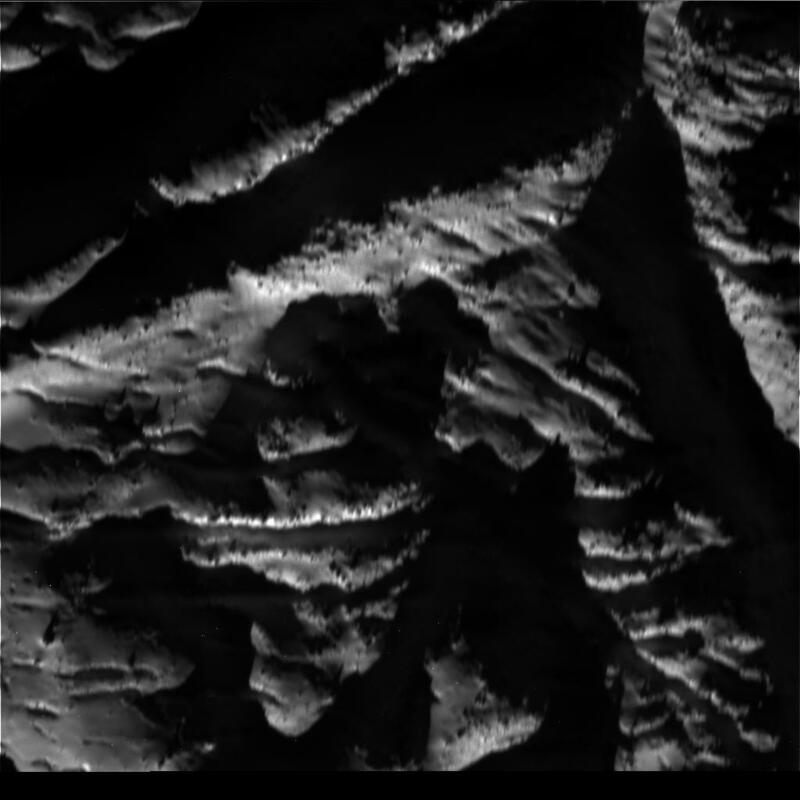 i remember Arthur C. Clarke predicting that mountain range. 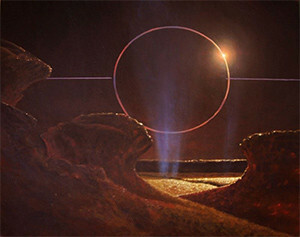 as Carolyn Porco said "How did he know?" 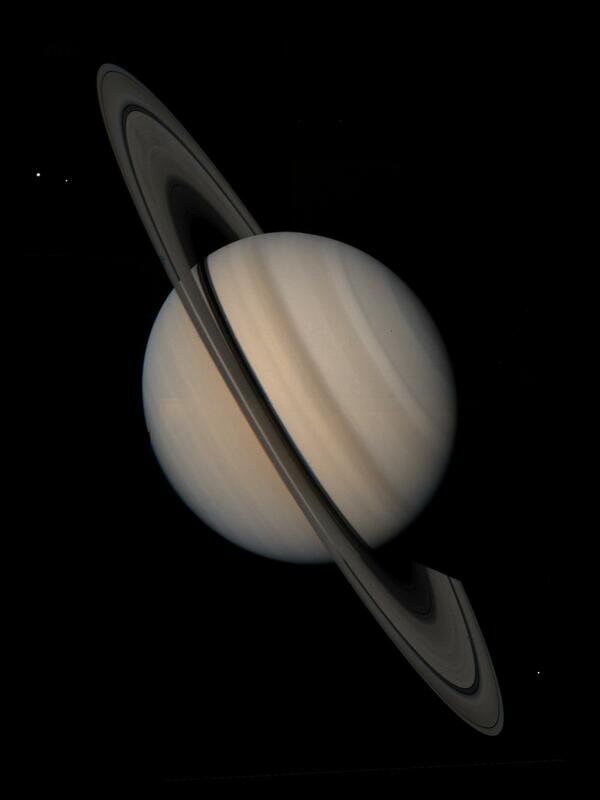 This too is amazing :) The Cassini Spacecraft passed 'behind' Saturn looking towards the inner solar system through the rings when the planet Venus, some 1.44 Billion KM / 890 Million miles was spotted throuht the rings on one ocassion prior to being eclipsed & then again righ next to Saturn's limb just after. 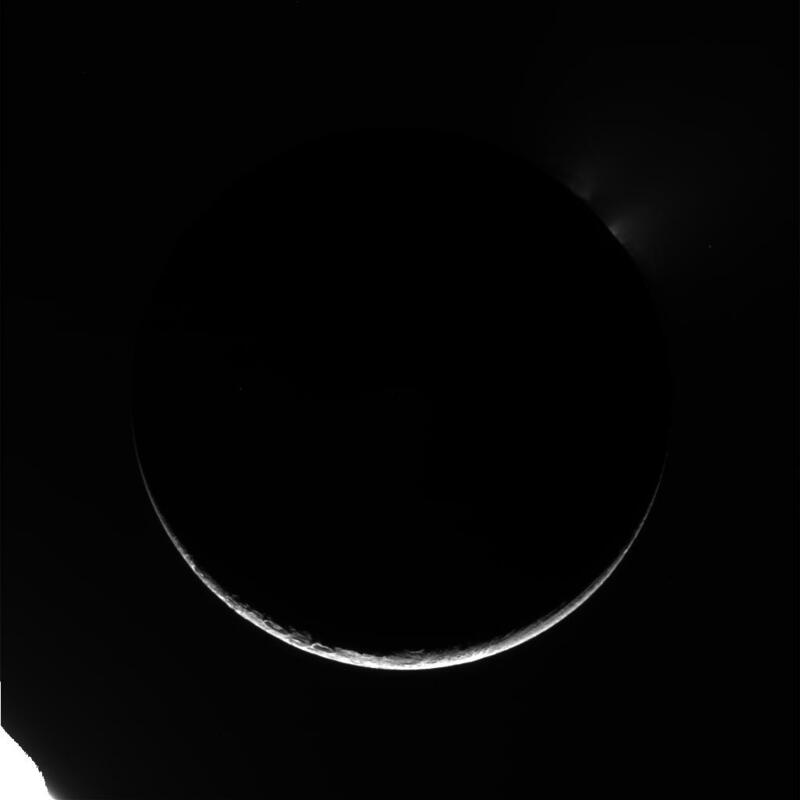 The Sun although appearing close by was eclipsed by Saturn. 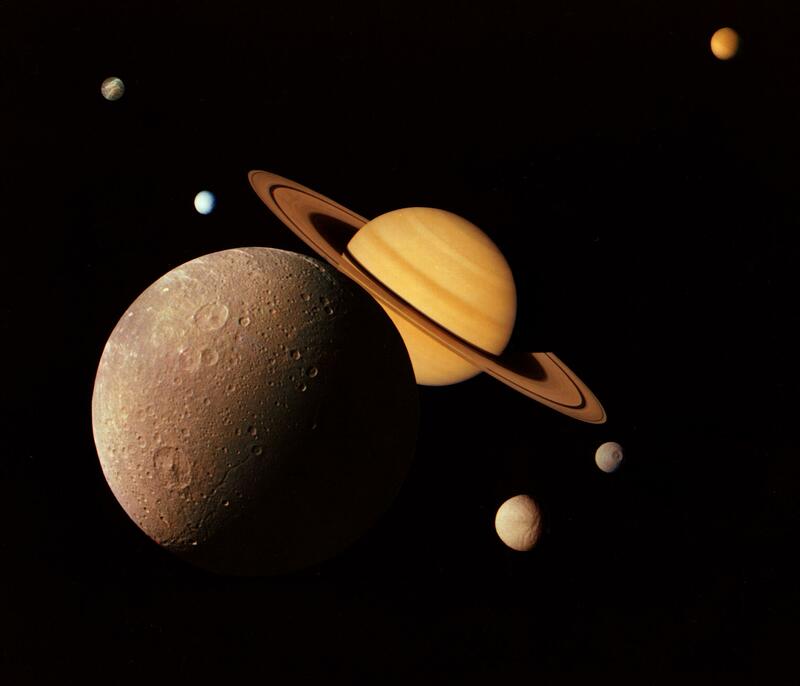 Both the Sun & planet Venus (Mercury, Earth & Mars too) appeared in front of the constellation of Cetus the Sea Monster, near the boundary with Aries the Ram. 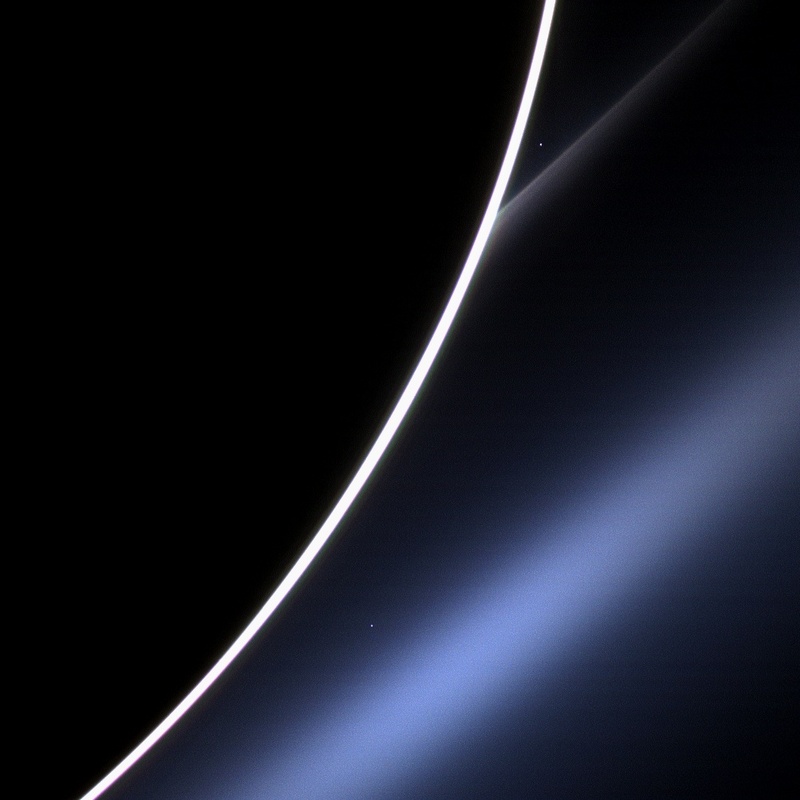 The bluish E ring is clearly visible. 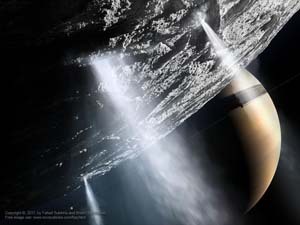 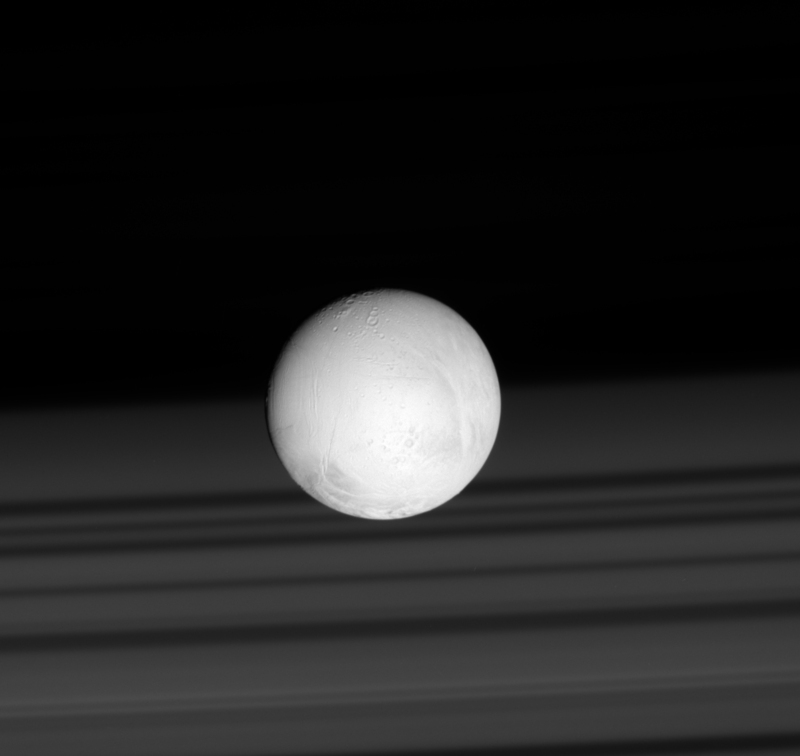 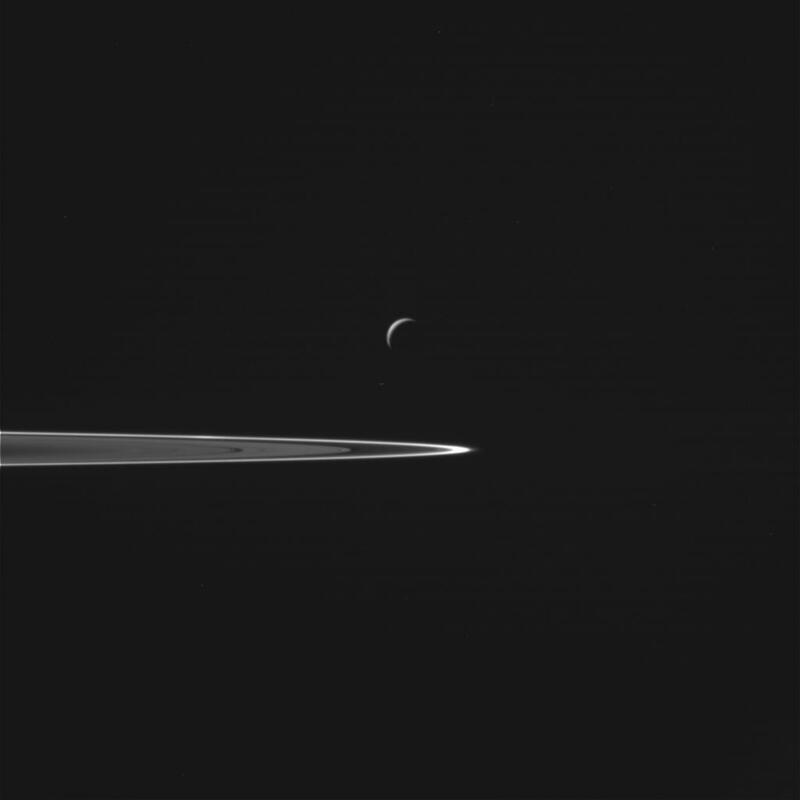 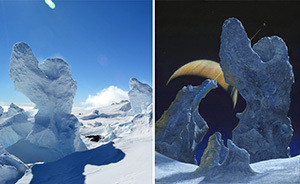 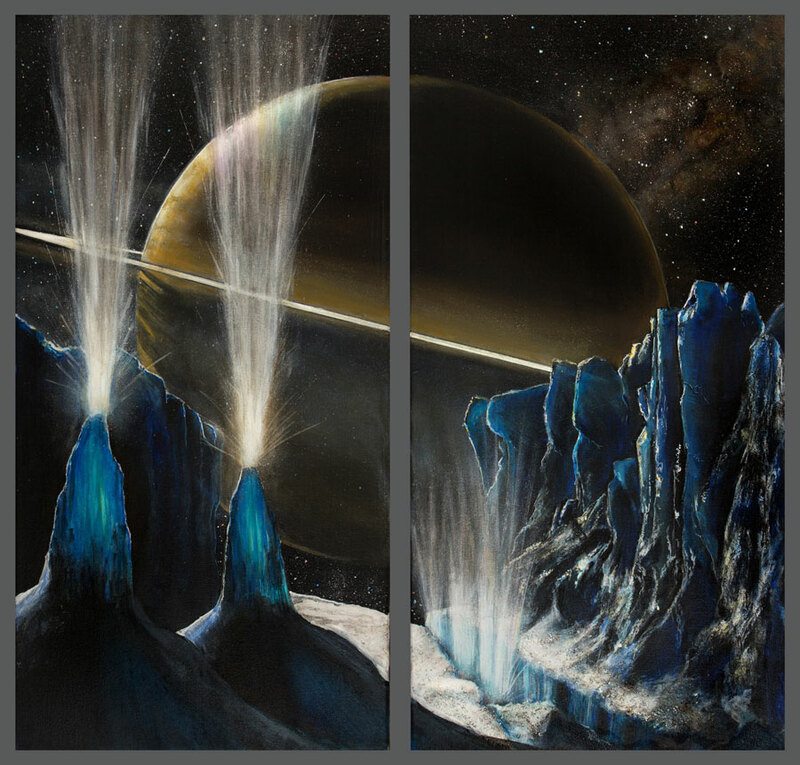 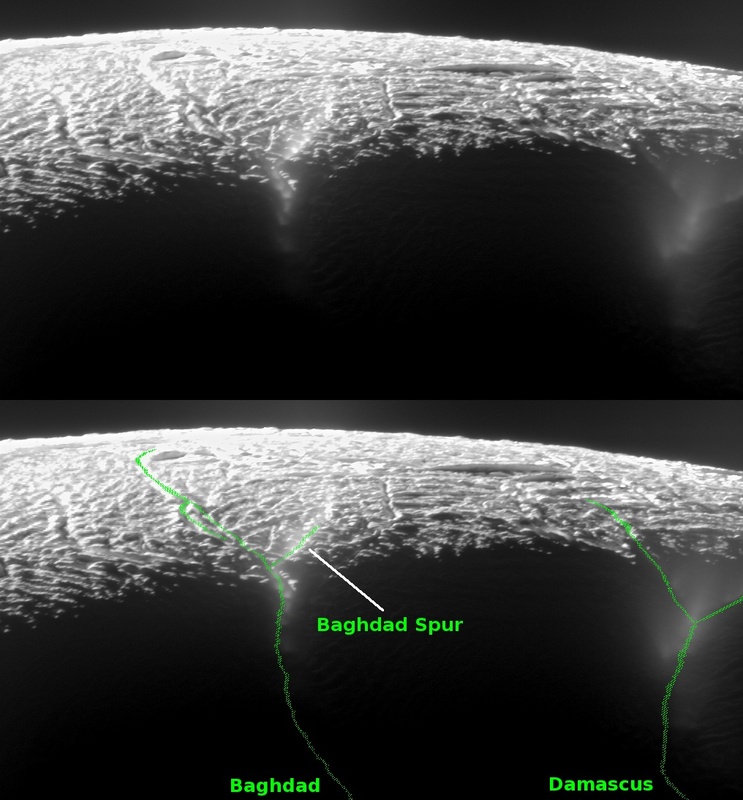 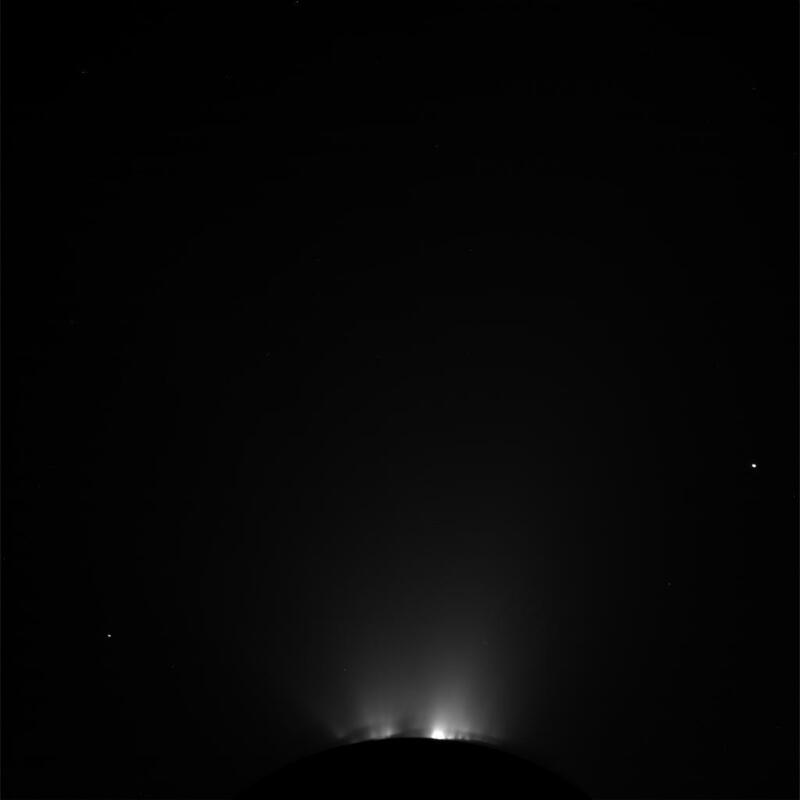 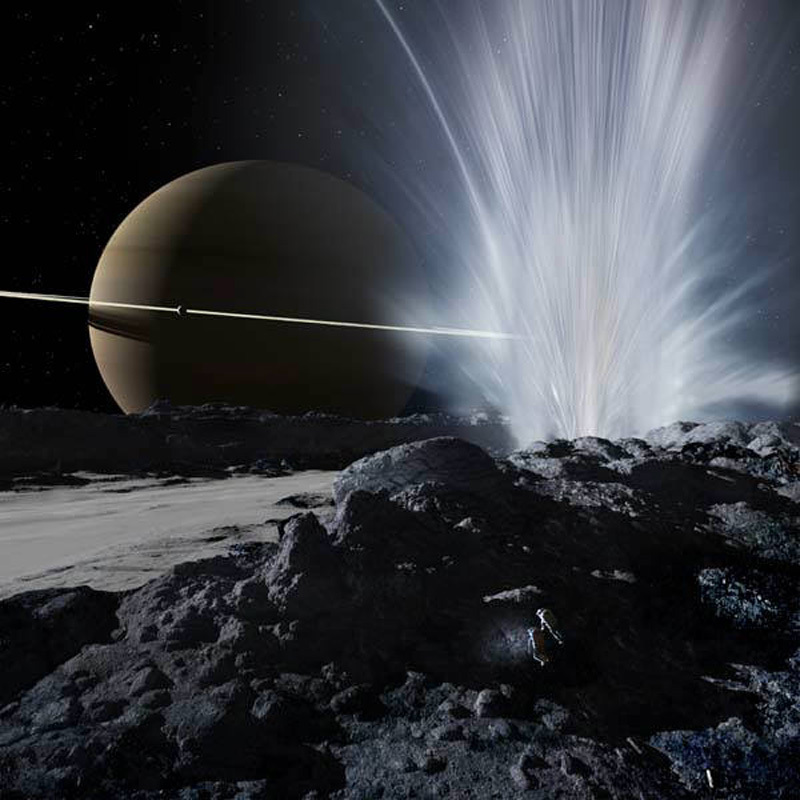 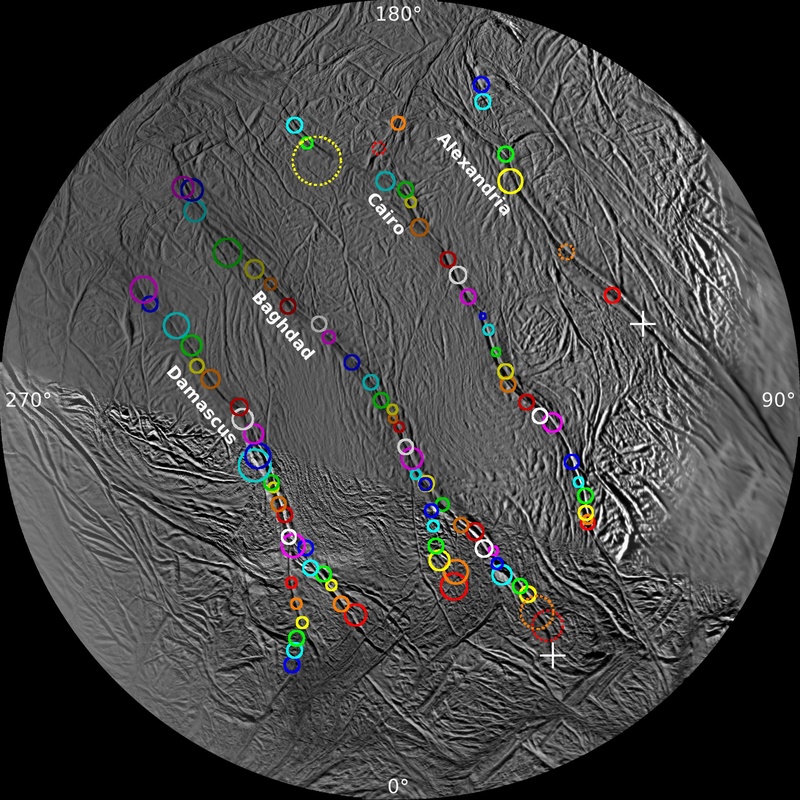 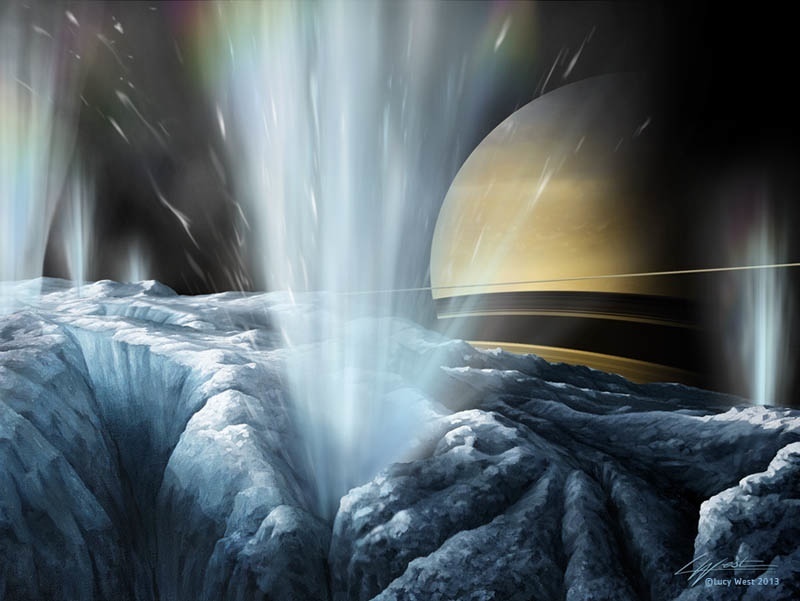 The E Ring is formed from ejected ice crystals from the south polar geysers on the Saturn moon Enceladus. 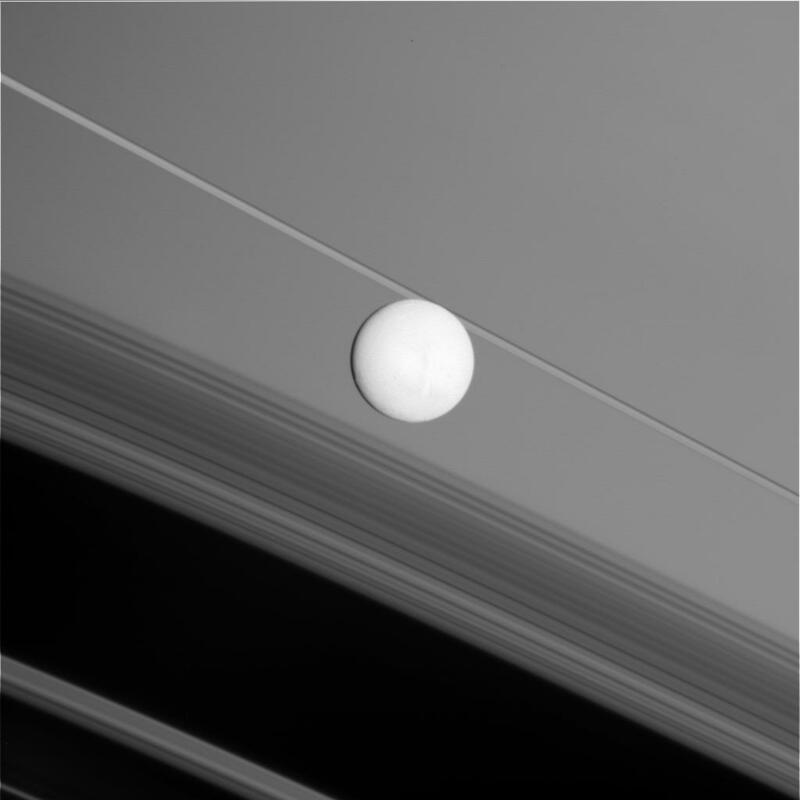 The G Ring is a much fainter, narrower ring, appears to be a mixture of dust & ice particles. The G Ring appears to be crud knocked off the tiny 500 metre / 1,640 foot wide moonlet Aegaeon. 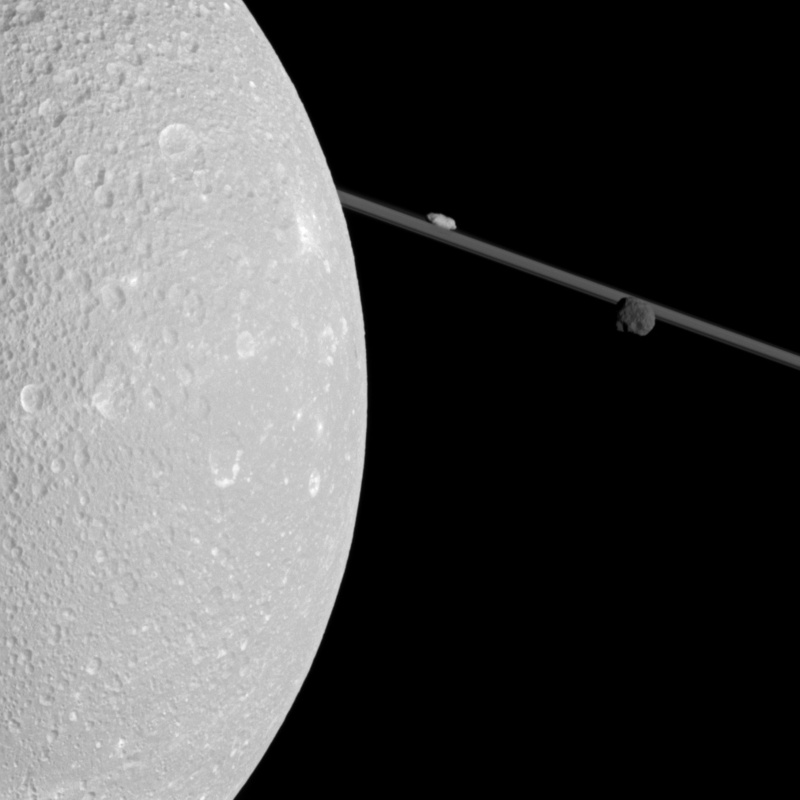 Can anyone identify the other bodies in the picture? 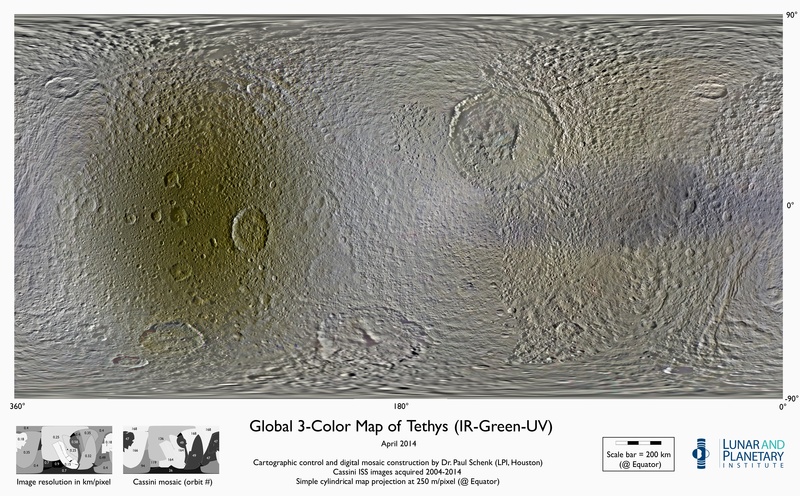 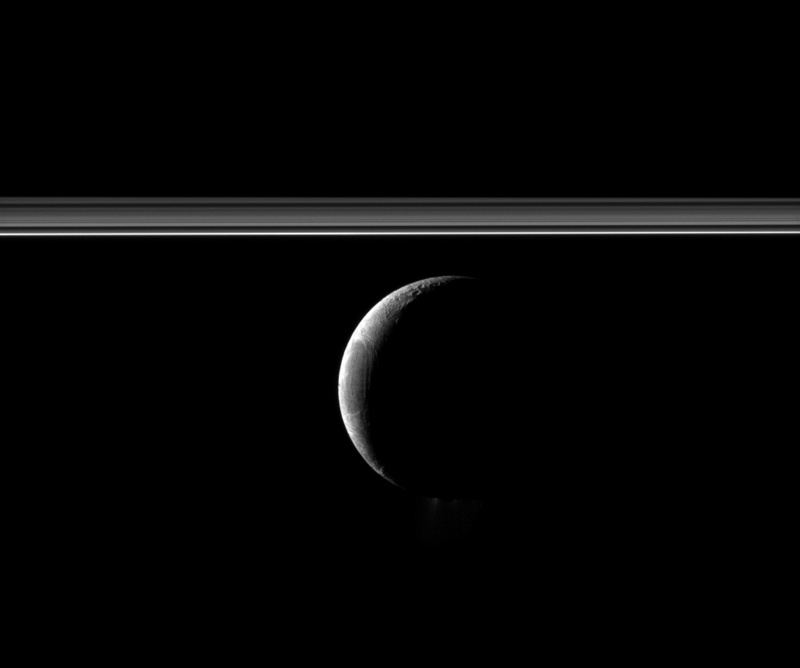 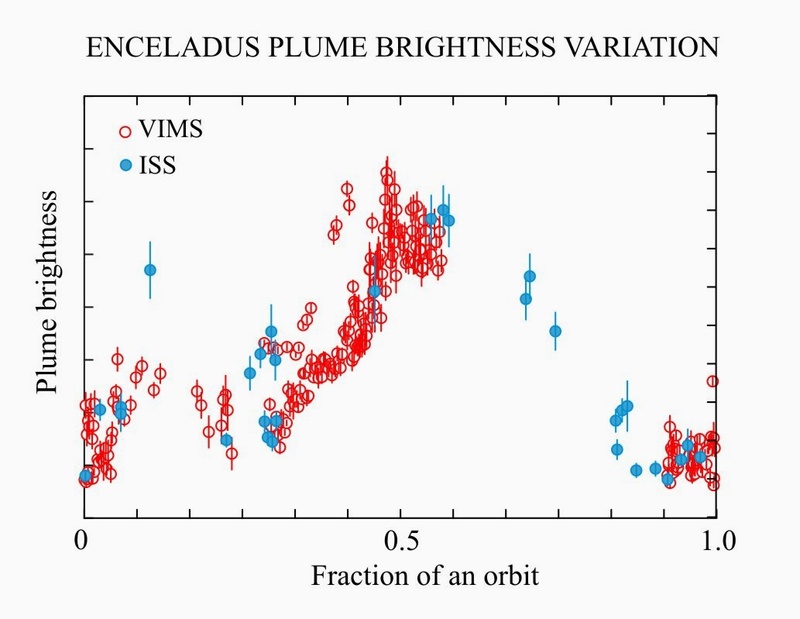 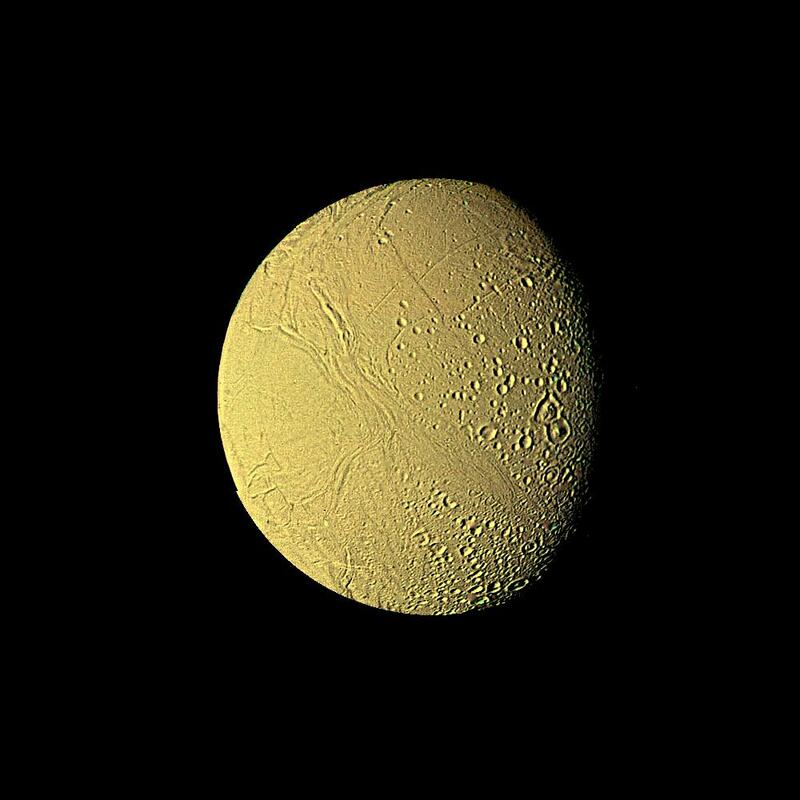 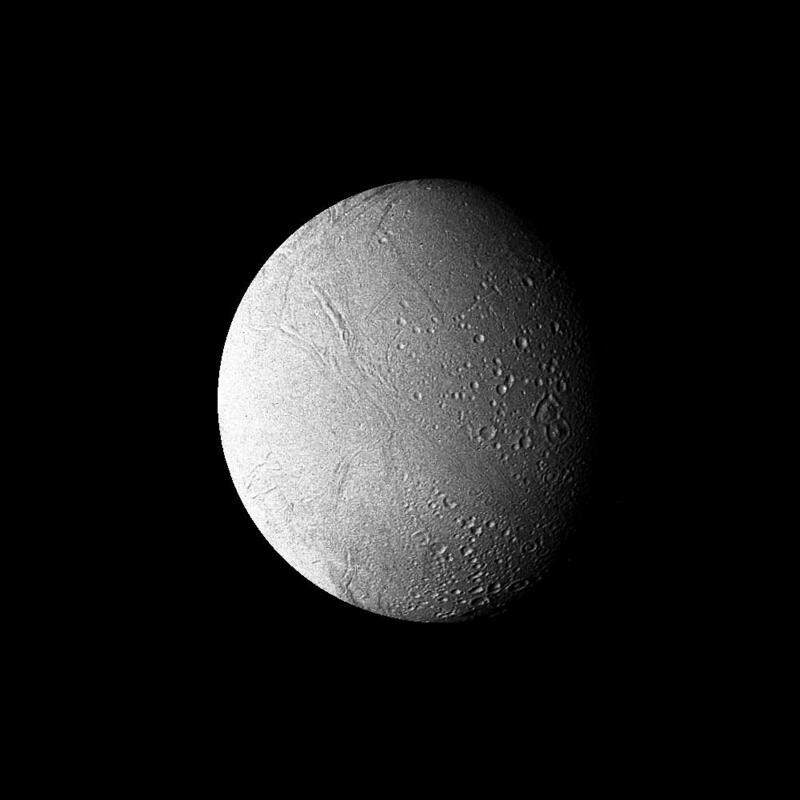 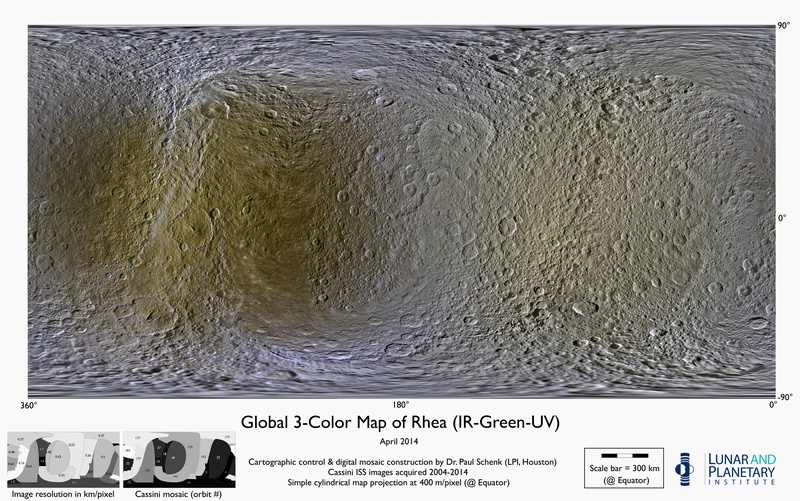 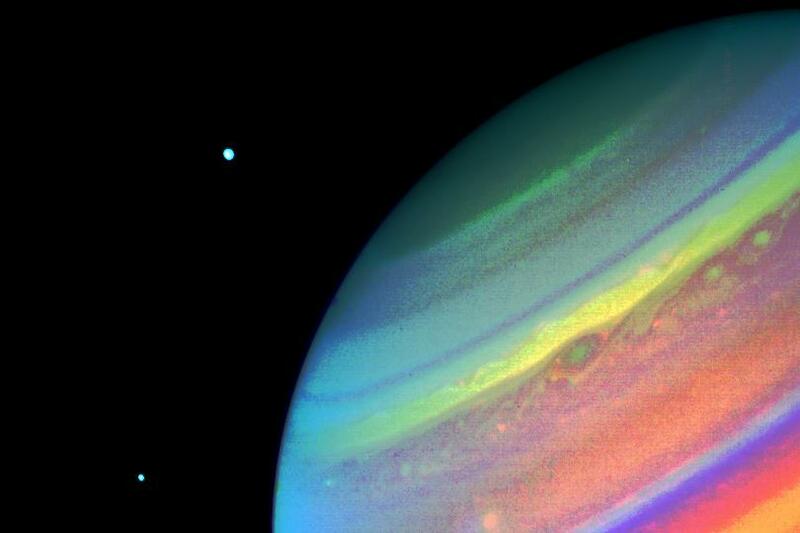 There are a few other dots that resemble Tethys and Enceladus in color. 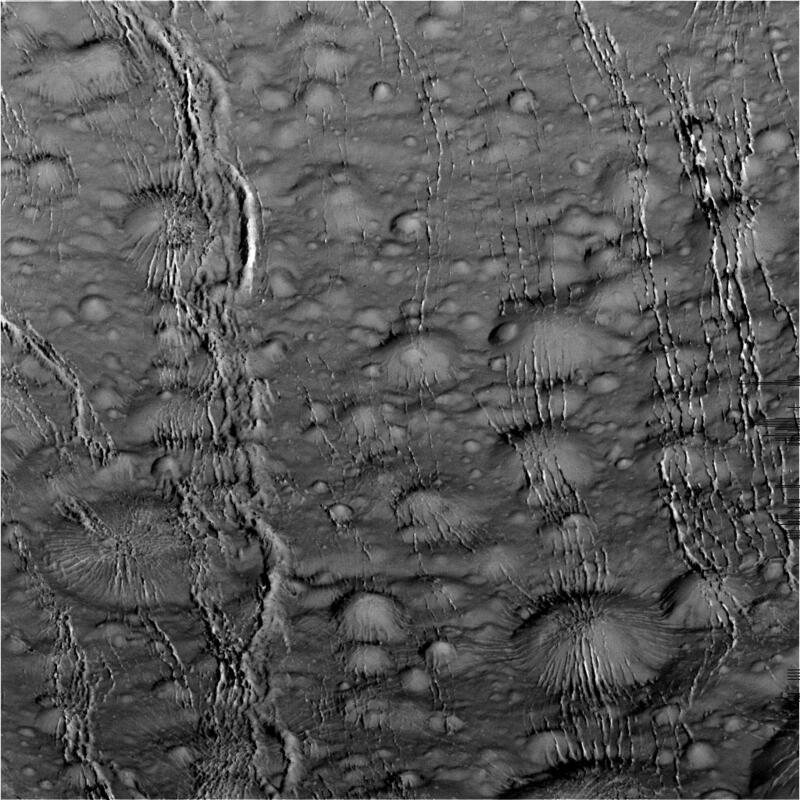 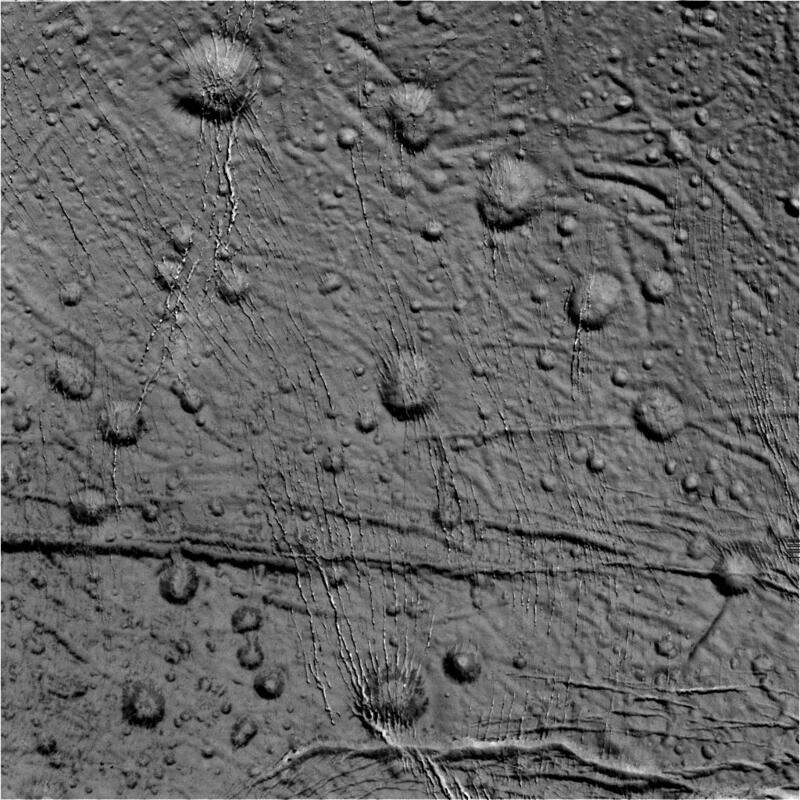 - Immediately to the right of Enceladus - Immediately to the left of the outer ring near the vertical midpoint of the ring structure - In the middle of the open space in the upper right quadrant of the image What an awesome photo - thanks Cassini (team)! 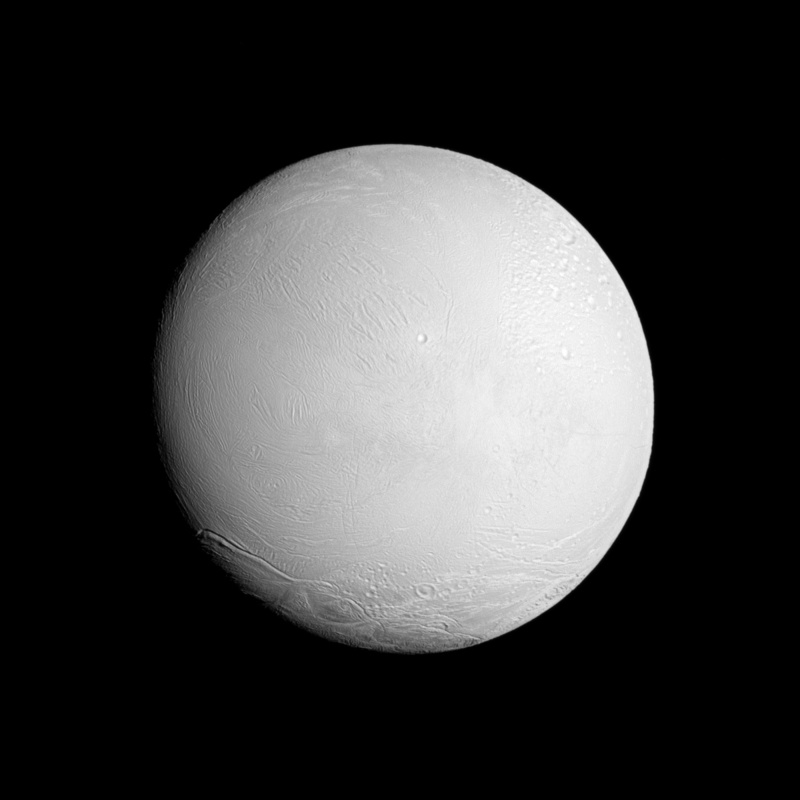 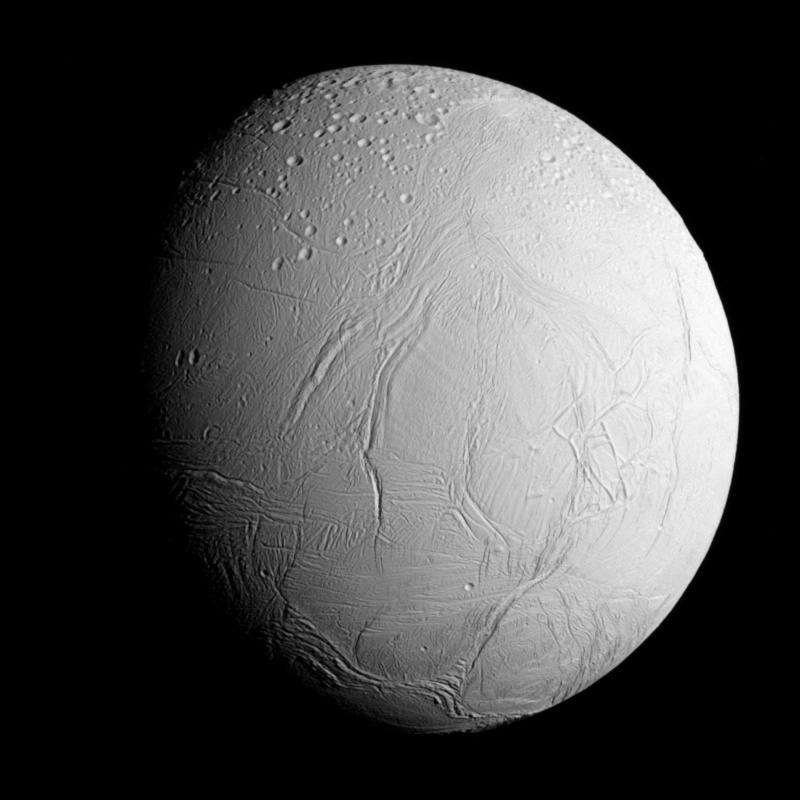 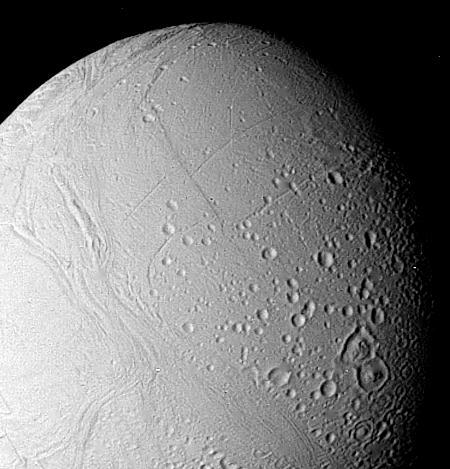 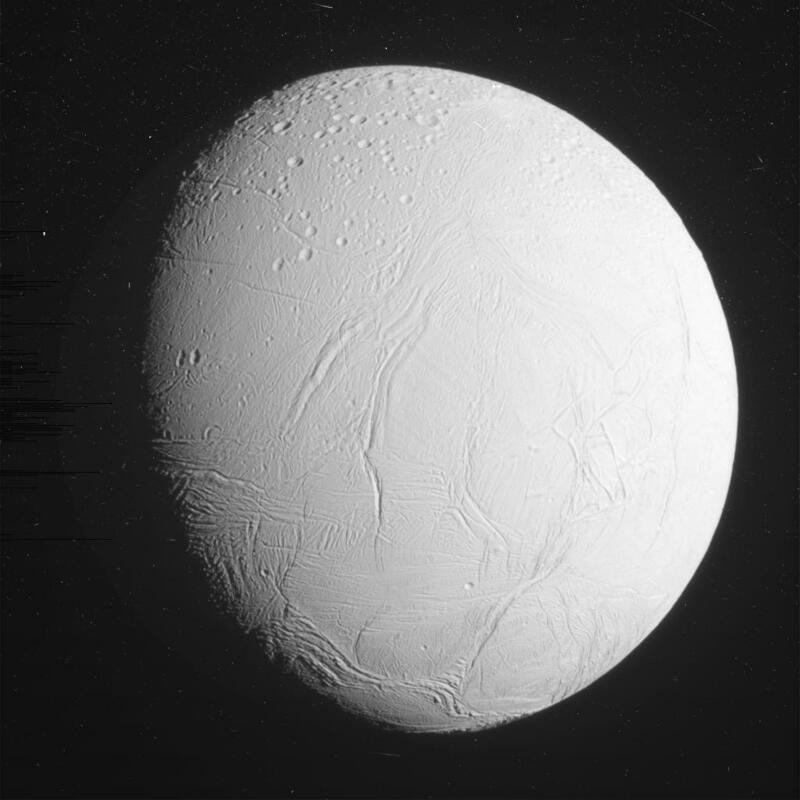 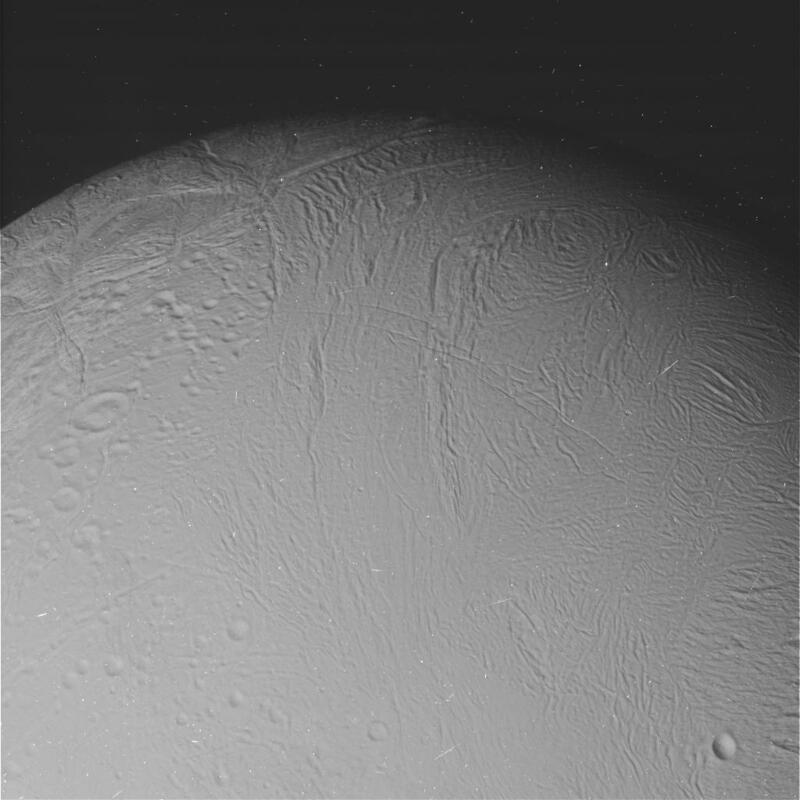 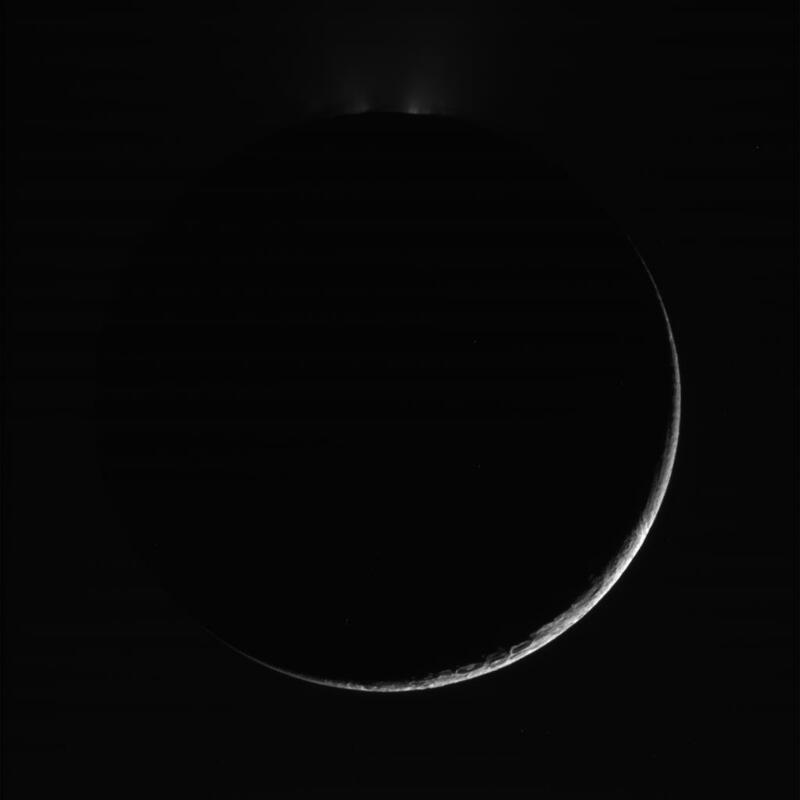 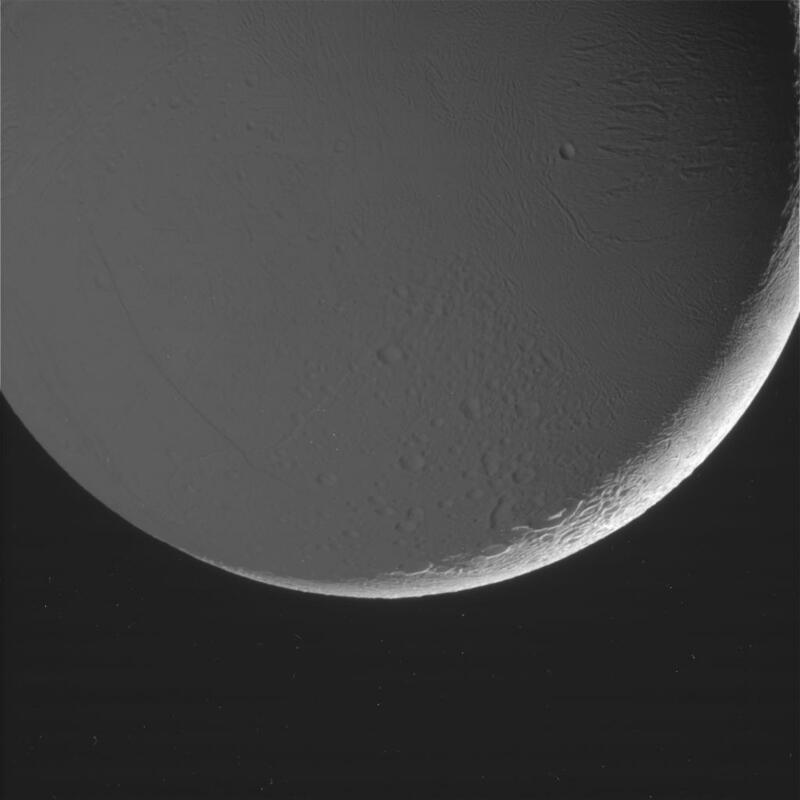 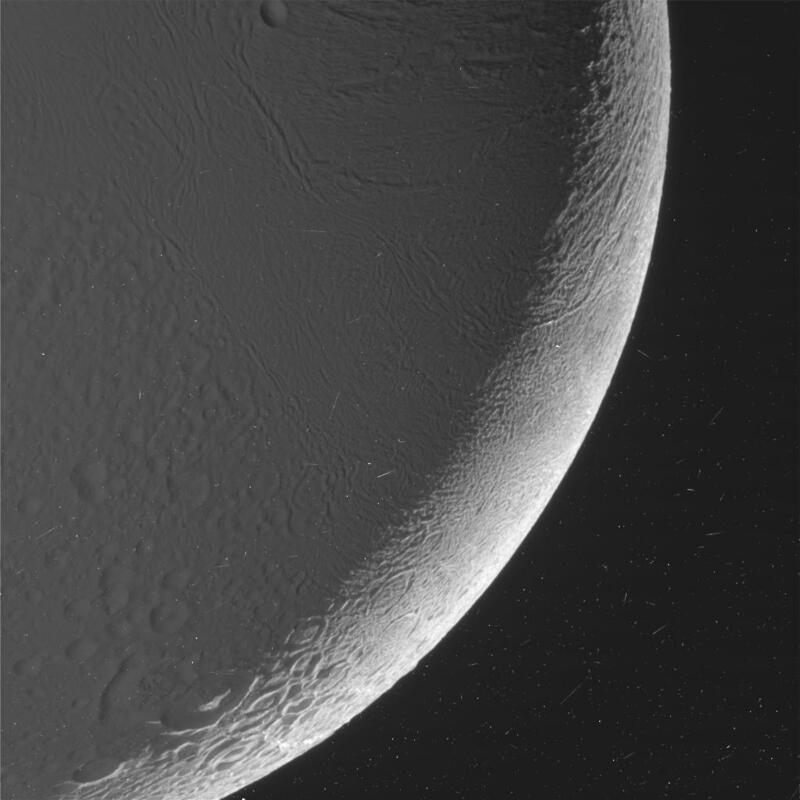 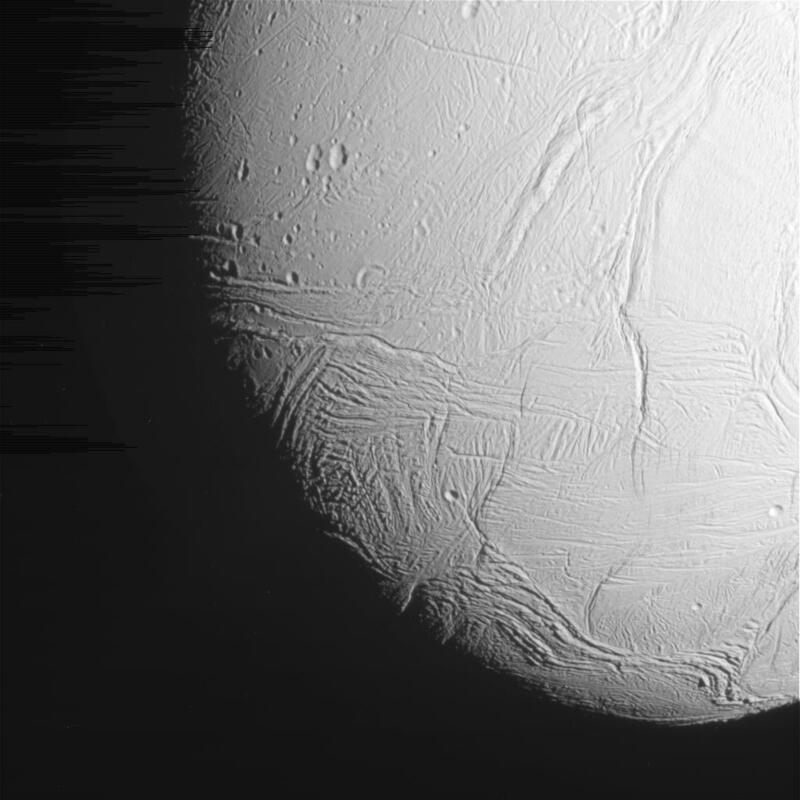 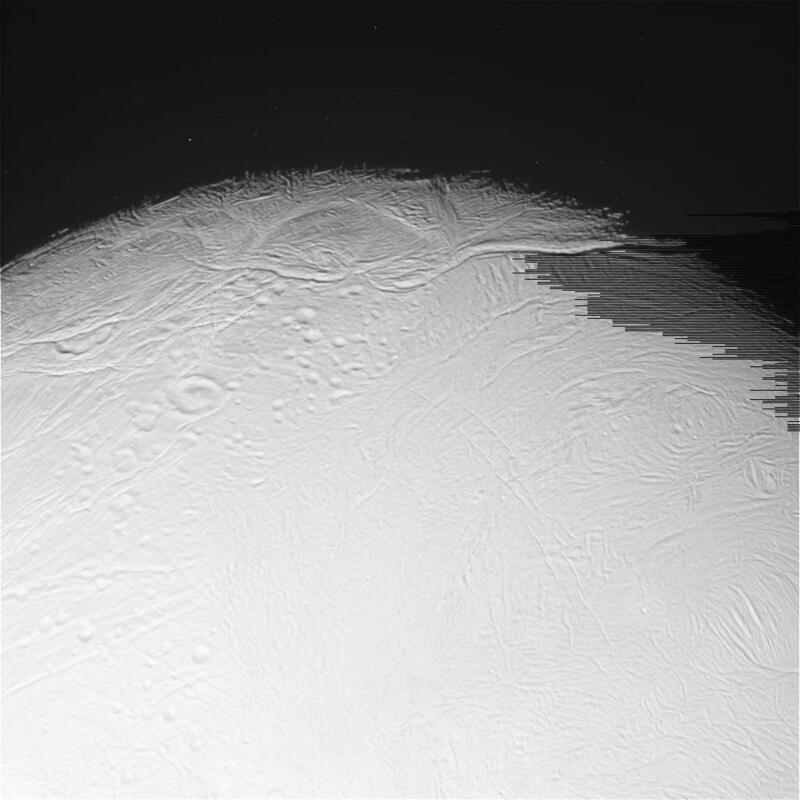 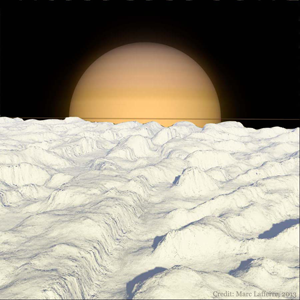 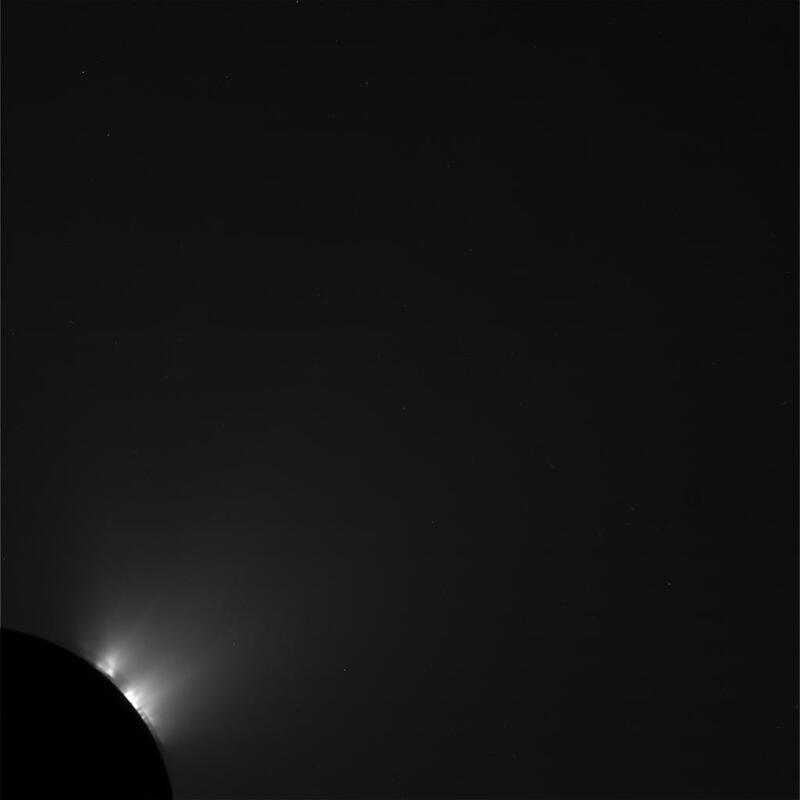 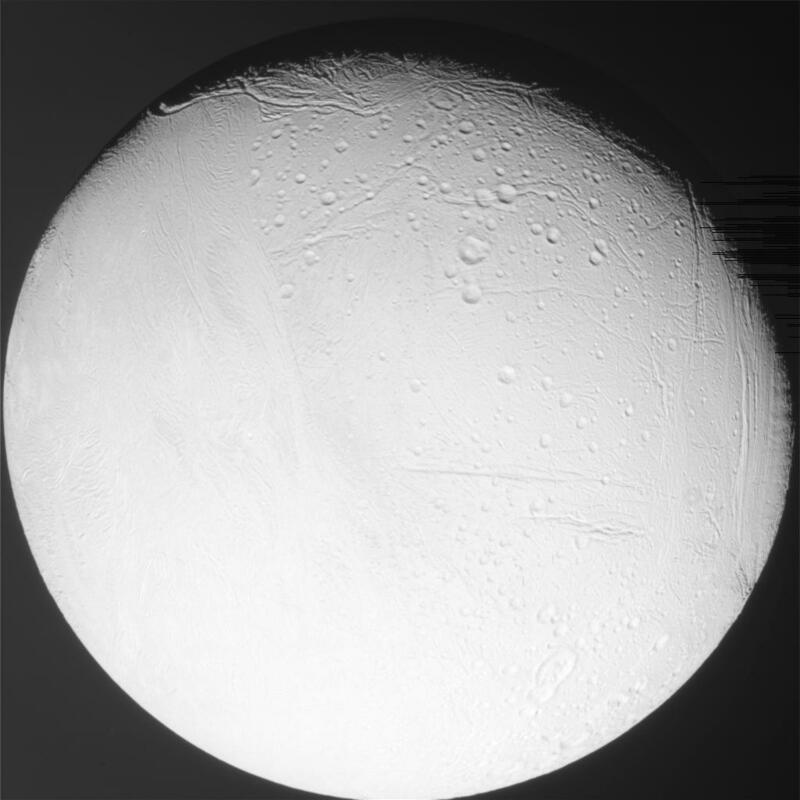 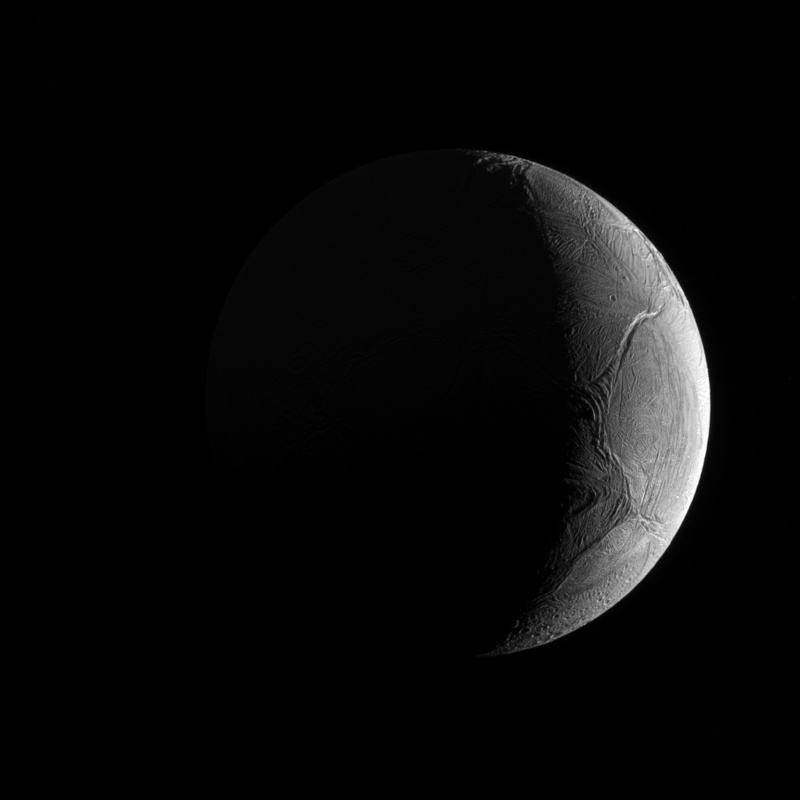 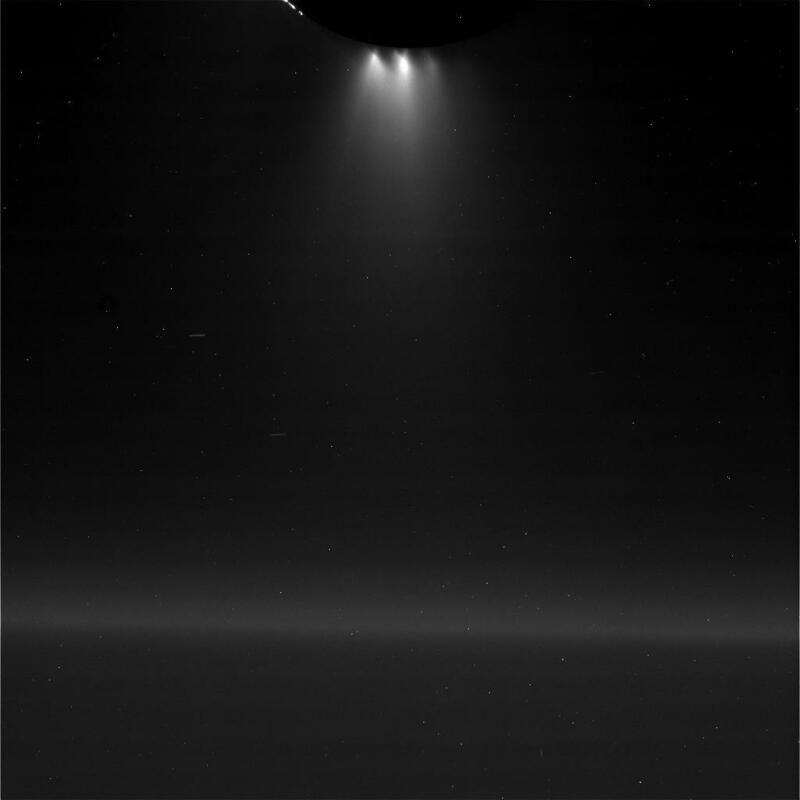 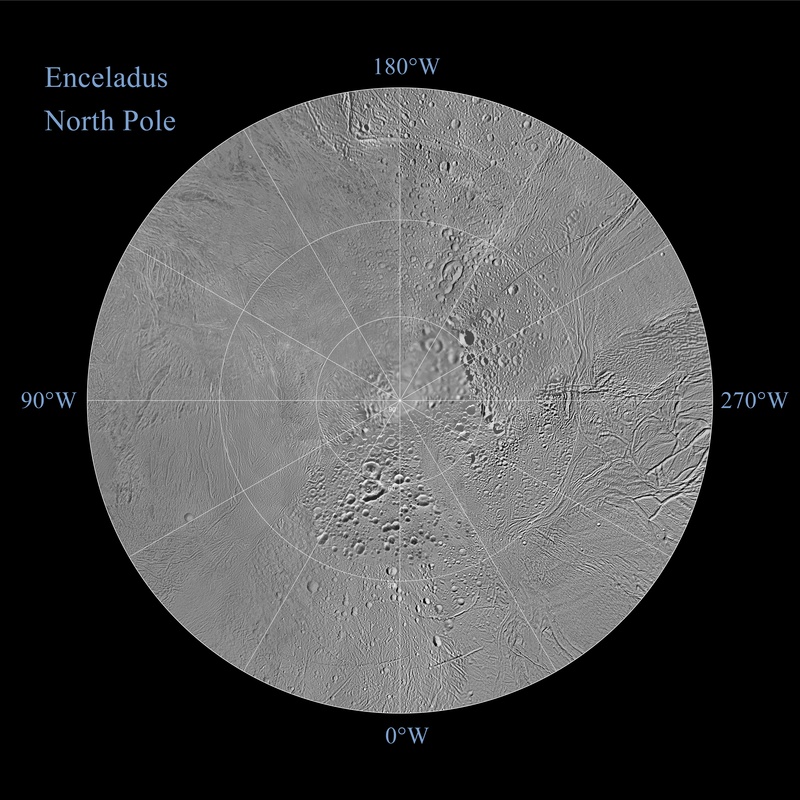 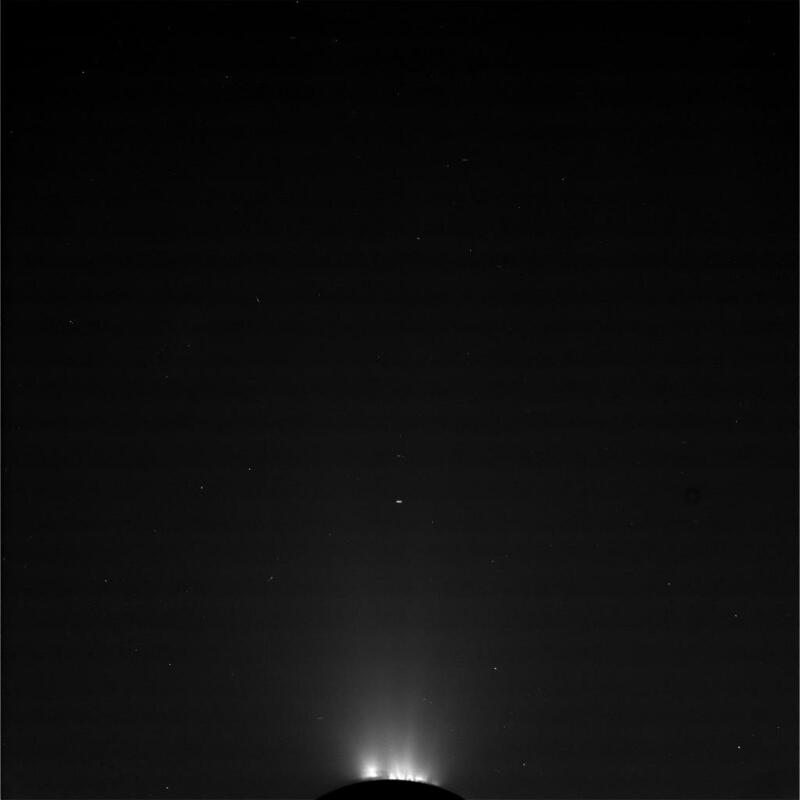 Impressive view of Enceladus, the white moon of Saturn. 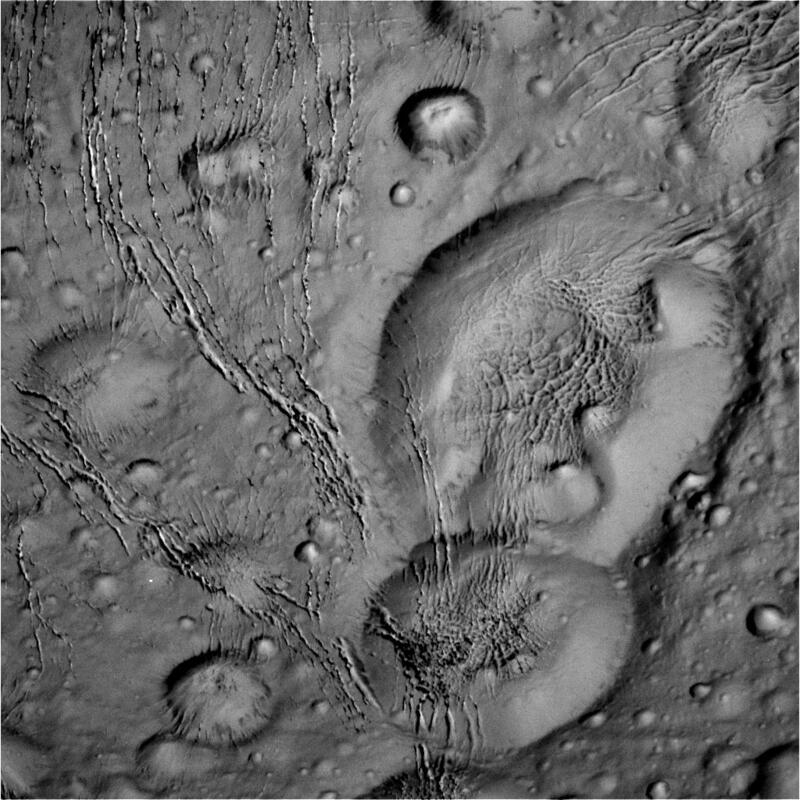 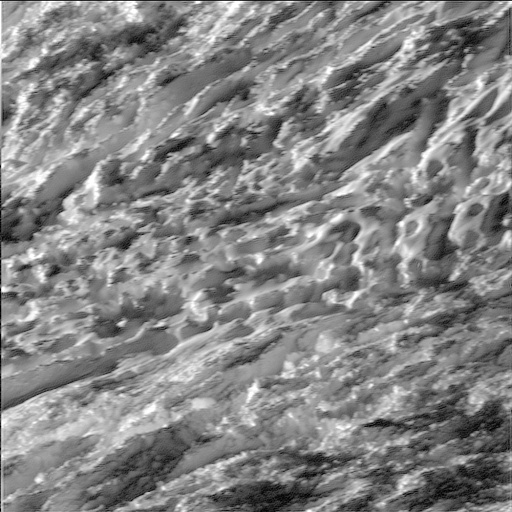 Fascinating graben at the upper right. 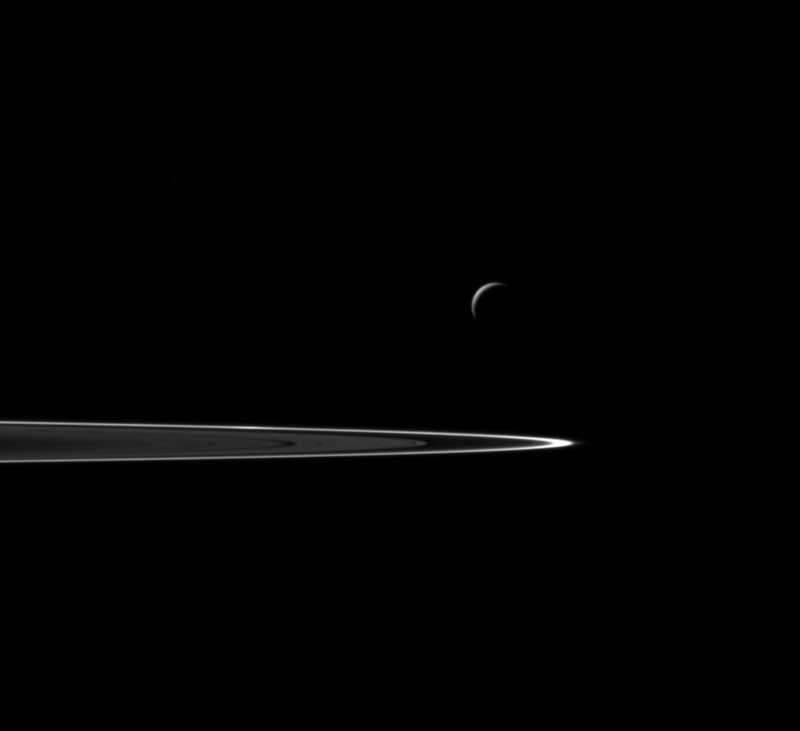 What a beautiful image. 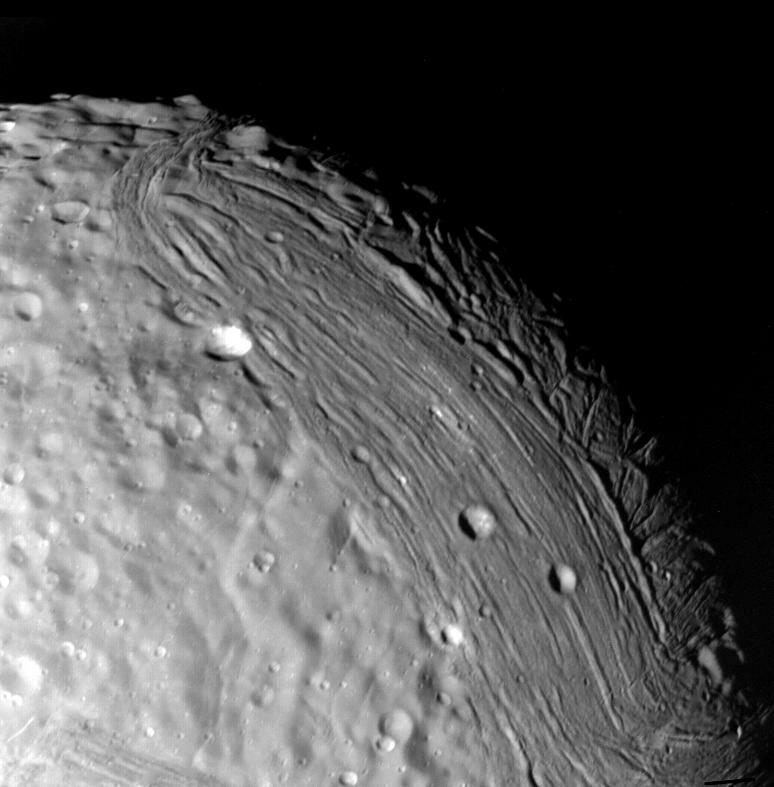 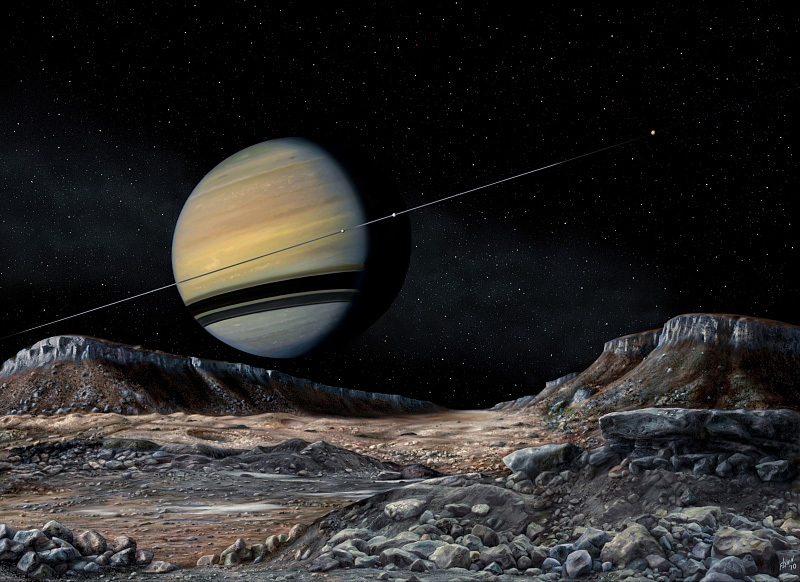 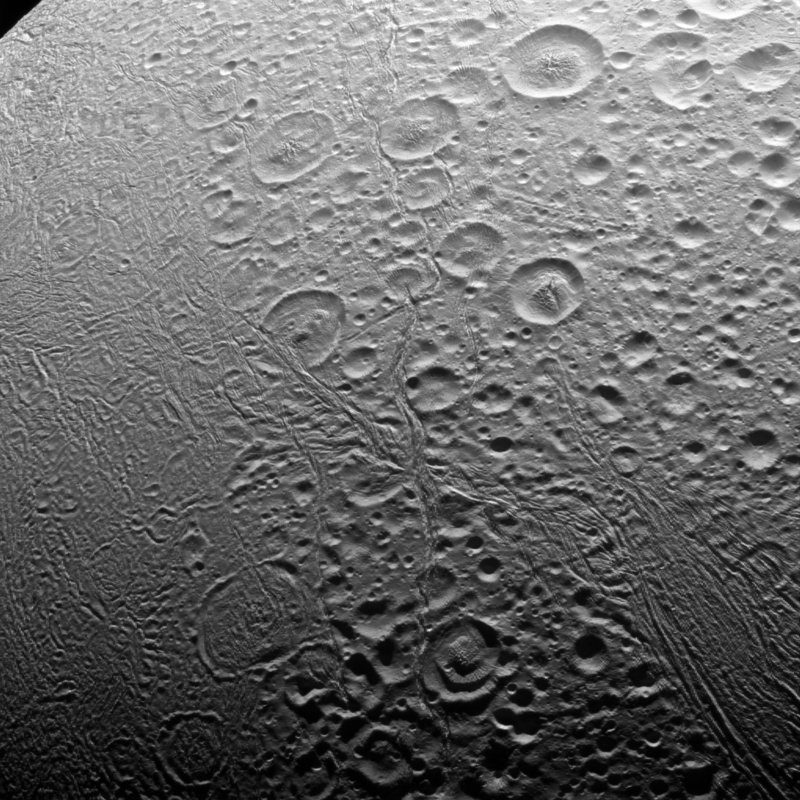 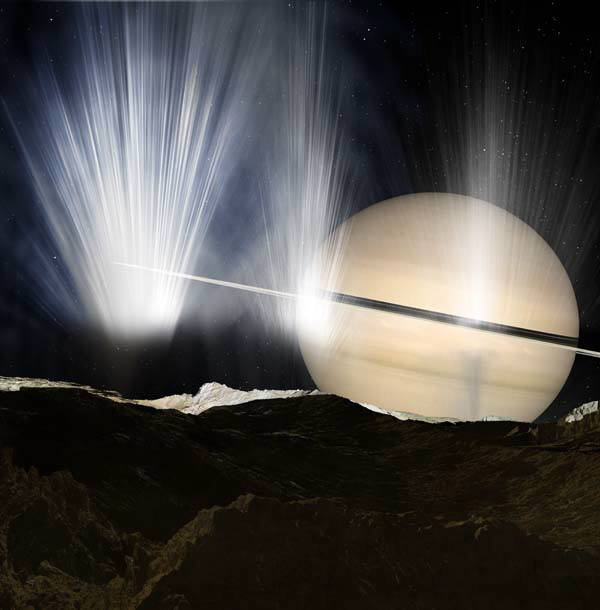 More proof of the complexity and serenity of the Saturnian system. 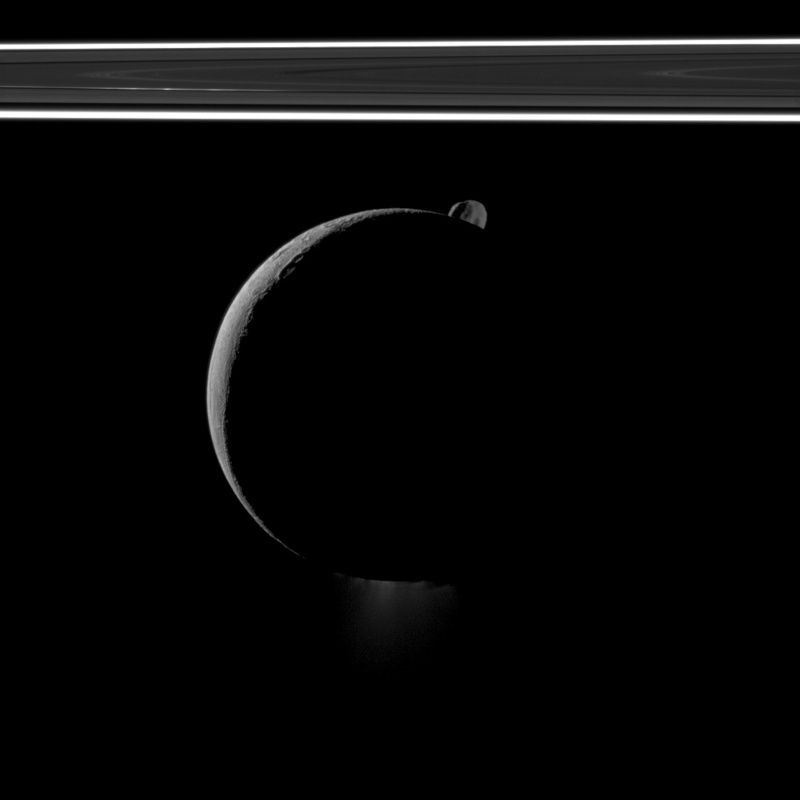 Thanks Cassini.